Fiery War Axe: did it warrant a nerf? Fiery War Axe is a basic Warrior class card, a 3/2 weapon that costs only two mana. While a simple card, it is probably the most powerful weapon in the game at the moment, and it is used in almost every Warrior deck of every archetype, from Pirate Warrior (aggro) to Control Warrior. This gives some justification for the nerf overall. 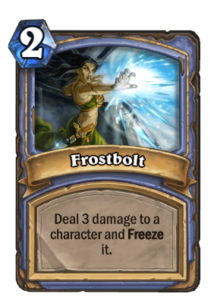 However, it is not obvious that this alone requires a nerf: Frostbolt, for example, is a Mage spell of similar power level that also sees play in all Mage archetypes. Most importantly, neither Fiery War Axe nor Frostbolt define the type of deck they are in: they are merely powerful, flexible cards that are useful in a wide variety of situations. Neither typically wins the game by itself, but both contribute to winning. Neither determines the gameplan of the deck either, as both are used in both aggressive and control archetypes. There are even more arguments in favor of a nerf. For example, in September 2016, Fiery War Axe was one of the five cards banned from BatStone #1 event based on a community vote – the community saw it as too powerful back then. The other banned cards were the RNG-heavy Yogg-Saron, Tuskarr Totemic, and Barnes, and the powerful non-RNG card Call of the Wild, which was later nerfed. While looking at that history, though, Call of the Wild would hardly warrant a nerf in today’s metagame, and the sixth-most voted card, a powerful non-RNG card Flamewreathed Faceless, does not see any play nowadays despite remaining the same card. Just because a card has been powerful at some point of time, does not mean that it is too powerful. There are arguments, and there are counterarguments. Alas, I am not here to argue whether the nerf was warranted. Let’s assume, for the sake of argument, that Fiery War Axe had to be nerfed. Then we can look at the details. Fiery War Axe: how was it nerfed, and what were the alternatives? Fiery War Axe has been a powerful Warrior weapon since the launch of Hearthstone. Already great tempo for its cost, Fiery War Axe is well complimented by Pirates and cards that synergize with weapons. Raising its mana cost by 1 will slow down the Warrior’s tempo and lower the overall power level of the card. Now, we know Blizzard considered two options: increase the mana cost to three, or lower the attack to two. We’ll come back to their justifications for their choice later, let’s first simply examine these two alternatives. Fiery War Axe is now the worst three-mana 3/2 weapon in the game. There are plenty of three-mana 3/2 weapons, and every other one has some additional upside. It is indeed the case that cards such as Eaglehorn Bow (Hunter) and Rallying Blade (Paladin) see play despite not always activating their effects. 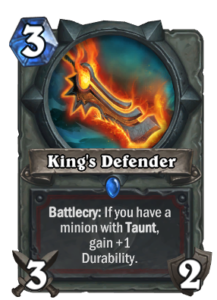 Fiery War Axe is now a direct downgrade from King’s Defender, a Warrior class weapon in Wild format, which is a three-mana 3/2 weapon with an upside. Fiery War Axe retains its capability to destroy three-health minions with a single swing, such as Northshire Cleric, Radiant Elemental, Arcanologist, Mana Wyrm, Vilefin Inquisitor, and Murloc Warleader. Fiery War Axe can no longer be played for two mana, obviously. As we will see, this is of major importance. Fiery War Axe can no longer answer a Turn one Mana Wyrm, Northshire Cleric, Voidwalker, or Vilefin Inquisitor. It can still answer a Turn one Murloc Tidecaller, Enchanted Raven, or Mistress of Mixtures. Fiery War Axe can no longer answer a Murloc Warleader or Arcanologist, or any other three-health minion, in the late game. Not alone, anyway. The importance of mana cost becomes clear when we examine the cards available to Warrior. Most classes have a class-specific minion available for two mana, often with a powerful effect (Radiant Elemental, Arcanologist, Pyros, Crackling Razormaw, Scavenging Hyena, Druid of the Swarm, Hydrologist, Primalfin Totem, Razorpetal Lasher, Undercity Huckster.. you get the point). What does the Warrior have? In Standard format, there’s Armorsmith, Hobart Grapplehammer, Cruel Taskmaster, Public Defender, and Cornered Sentry. That is an extremely underwhelming list. Armorsmith is a good card, but only for slower archetypes, and most of the time it is not played on Turn two even if that was possible (you may sometimes do that against aggro). Armorsmith is an evergreen card, so it will always be available. What about at three mana? There’s Bloodsail Cultist, Frothing Berserker, Mountainfire Armor, and Ravaging Ghoul. Throw in Shield Block for good measure. Warrior’s toolkit at three mana is currently extremely well-rounded, and while Ravaging Ghoul and Bloodsail Cultist will rotate out of Standard next year, Warrior’s three-mana toolkit is already secured for both aggressive (Frothing Berserker – evergreen) and slower (Shield Block – evergreen, and Mountainfire Armor – Frozen Throne) archetypes for the next two years. Therefore, it is difficult to see the justification for this specific nerf at this time. It will make Warrior’s two-mana slot extremely weak at least until the next expansion. It will create a card that is a direct downgrade of an existing card of the same class, instead of a unique card. It will create a card that is worse than any other similar card for any class. It will add a card to a mana slot that is already well-rounded. It misses out on an opportunity to have the card play well together with existing class synergies – two-mana 2/2 Fiery War Axe into three-mana Ravagin Ghoul to deal with a Murloc Warleader, for example. They never stated that it was not enough, that the card would have been too strong as a two-mana 2/2, which would have been a significantly stronger card than a three-mana 3/2 for the Warrior class in particular. Obviously, changing a two-mana 3/2 into a two-mana 2/2 would have already been a significant nerf. What was the real reason behind the nerf, or, why players are upset now? Players are upset because the reasoning offered for this particular choice is not believable. 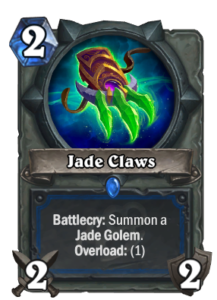 Had Blizzard simply stated that a two-mana 2/2 was still too strong, and they needed to make an even bigger change, that would have been believable. Claiming that turning a 3/2 into a 2/2 doesn’t feel intuitive, and worse yet, that “changing the mana cost of a card is less disruptive, because you can always see the mana cost of cards in your hand” seems of minor importance. This spawned a debacle on Reddit, where Ben Brode from the design team went on to defend their choice of words by stating that they do not think their players are stupid. Yet, he went on to elaborate that people learn the effects of the cards by heart, and therefore changing the mana cost makes the change more apparent for players than changing the effect of the card. Perhaps Blizzard has conducted extensive user experience testing and found that indeed, there is a significant difference in player reaction and learning when changes affect the mana cost, and not the other effects of the card. However, this seems implausible. Obviously, you see the mana cost first, so there is some advantage to changing the mana cost instead of the effect. However, making this the central justification is mind-boggling, as the difference seems to be of such minor significance as to be irrelevant. This is why players are upset. 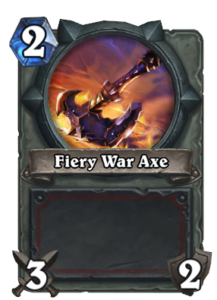 Blizzard themselves told that they considered another alternative to the way Fiery War Axe is nerfed, an alternative that would have retained the soul of the card and its spot in its class much better, but they went on to make another change that is much more severe with the only justification that it would be easier to learn. The logical conclusion is that Blizzard wanted to nerf the card more. It is the only explanation that makes sense. If this is not the case, I sincerely hope they reconsider the nerf and make Fiery War Axe a two-mana 2/2 instead, as that would be much better for the game: it would give Warrior a mediocre evergreen weapon, usable whenever no other, more powerful cards are in print, but not one that is overpowered by any means. And isn’t that what an evergreen set is supposed to be able to deliver? First, interesting article. I’m a huge fan of warrior so this nerf was not only severe but unexpected to me at this time. I must say that I disagree with nerfing it to a 2 mana 2/2 OR a 3 mana 3/2. I think adding an effect like gain 3 armour (and making it cost 3 mana) would be good, and solidify it in a control warrior deck. Currently, as you say, it will never be played in Wild and it’s subpar to other classes’ 3 mana weapons now. Another point I want to make: why do good cards always need to be nerfed? I mean, Wrath is in every druid deck, Frostbolt in every mage deck, Lightning Bolt in a ton of Shaman decks…. and they don’t see nerfs. Obviously FW is a great card, even an overpowered card… but who cares? It’s a weapon and I don’t believe that it’s that broken that it directly affects winrate. Anywho, that’s just my opinion. Good article!